There’s nothing quite like a chocolate chip cookie. There are so many iterations of and preferences for the perfect chocolate chip cookie, but this is mine: golden brown on the outside, chewy and gooey on the inside. 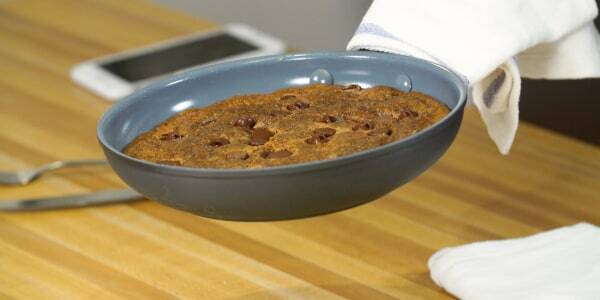 The cookie must be studded with melty chocolate chips and have a soft, slightly underbaked center. Sound good to you? I've had many goals in life, but one was to master my ideal chocolate chip cookie using my favorite ingredients, like almond flour and coconut sugar. After several rounds, and dozens of cookies later, I accomplished sheer perfection with my vegan and gluten-free chocolate chip cookie pie. This is one of the most highly requested recipes by my friends and family, and also one of the most popular recipes on my website. I created this recipe when I was in desperate need of something sweet to eat with my afternoon coffee (OK, so maybe I get that feeling every day around 3 p.m., but I digress). My chocolate chip cookie pie uses no dairy, no eggs and no grains (but you would never believe it), and it uses just three tablespoons of oil in the whole recipe. One of my secrets to keeping this super decadent and creamy? I use maple almond butter to add a gorgeously warm flavor without adding a bunch of extra refined sugar. Don’t let any of this talk fool you, though; I’ve tricked pretty much everyone into thinking that it is just like any regular chocolate chip cookie — but it's bigger and better! The best part about this recipe is that it’s super easy to whip up; just make sure you have an oven-safe skillet or round pan on hand before you get started. It’s a fantastic choice to make for any dinner party, a night in with your friends or to share with someone you love for Valentine's Day. Or ... just keep it all to yourself. I’m not here to judge. When you make this recipe, tag me on Instagram, @dadaeats and @todayfood, so I can see your creations! Check out my YouTube series "#COOKING"and be sure to subscribe to TODAY's YouTube channel for more original lifestyle series. 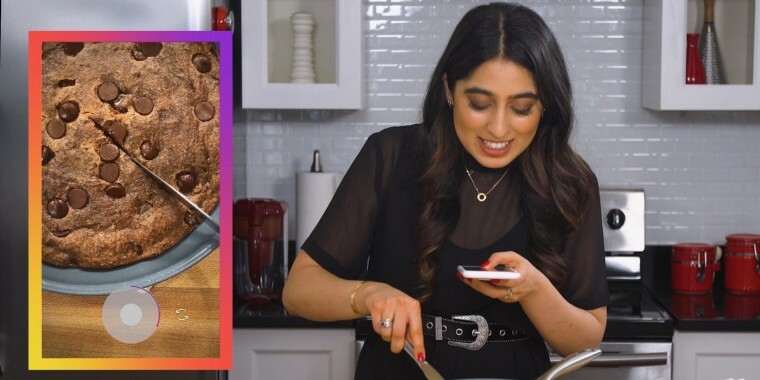 Samah Dada is the founder, recipe developer and photographer for her food Instagram and health and wellness-focused food and travel blog DADAEATS. She grew up in Newport Beach, California, and spent four years in London, England, where she first became enamored by the intersection of food, travel, and culture. She started @DADAEATS with the goal of sharing her culinary endeavors, food adventures and passion for creating indulgent yet healthy eats with her audience.